When you click the link to your blog in the navigation tab, you go directly to your WordPress Dashboard page. Several modules on the Dashboard provide you with information about your blog, as well as actions you can take to navigate to other areas of the Dashboard, such as writing a new post and adding a new link or blogroll. You can configure the Dashboard modules by moving them around on the page and changing the way they display. Hover your mouse pointer over the title bar of the module you want to move. Click and drag the module to the spot you’d like to move it and release the mouse button. This drag-and-drop capability is available not only on the Dashboard page but also on all the inner pages of the WordPress Dashboard, so you can truly configure the panel to suit your needs. You can also expand (open) and collapse (close) the individual modules by clicking the mouse anywhere within the gray title bar of the module. This configuration feature is really nice because it allows you to use the Dashboard to see just those modules that you use regularly. The concept is easy: Keep the modules you use all the time open and close the ones that you use only occasionally — you can open those modules only when you really need them. Additionally, you can click the Screen Options tab at the top right of your Dashboard screen to configure other options for your Dashboard display, such as which modules you would like to show or hide. The navigation menu on the WordPress Dashboard appears on the left side of your browser window. 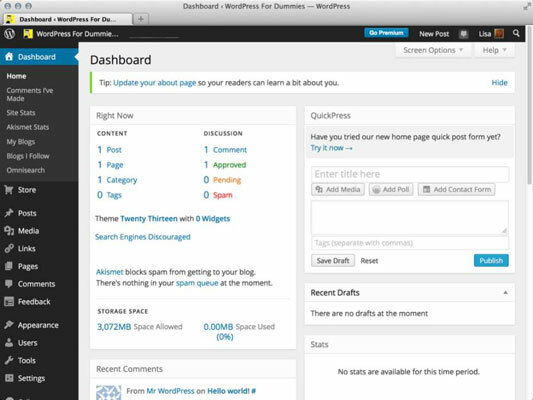 When you need to get back to the WordPress Dashboard, click the Dashboard link. Each navigation item has a submenu of links associated with it — hold your mouse pointer over a menu item, and the submenu flies out to the right side, so you can click any of the submenu links. The Right Now module of the Dashboard gives you some stats on what’s happening in your blog this very second. The Dashboard displays information about comments on your blog under the Discussion header in the Right Now module. Specifically, you find the total number of comments currently on your blog. Clicking any of these four links takes you to the Edit Comments page, where you can manage the comments on your blog. Scroll further down the Dashboard page to find a module titled Your Stuff; in it, you see items such as recent posts and recent comments on your blog. The What’s Hot module provides information about happenings in and around WordPress, including WordPress news, top blogs, top posts, fastest-growing blogs, and the latest posts made to blogs on WordPress. This module helps you stay in touch with the WordPress community as a whole. If you’re using a brand-new WordPress blog, the Recent Drafts module displays the message because you have not written any drafts. As time goes on, however, and you have written a few posts in your blog, you may save some of those posts as drafts to be edited and published later. These drafts will be shown in the Recent Drafts module. WordPress displays up to five drafts in this module and displays the title of the post, the date it was last saved, and a short excerpt. Click the View All button to go to the Manage Posts page, where you can view, edit, and manage your blog posts. Click the Screen Options tab at the top-right of the Dashboard. Clicking this tab drops down the Screen Options menu, displaying the title of each module with check boxes to the left of each title. Deselect the module you want to hide on your Dashboard by clicking the check mark in the check box. The module you deselected disappears from your Dashboard. If you’ve hidden one module and find later that you really miss having it on your Dashboard, you can simply enable that module again by selecting it on the Screen Options menu.